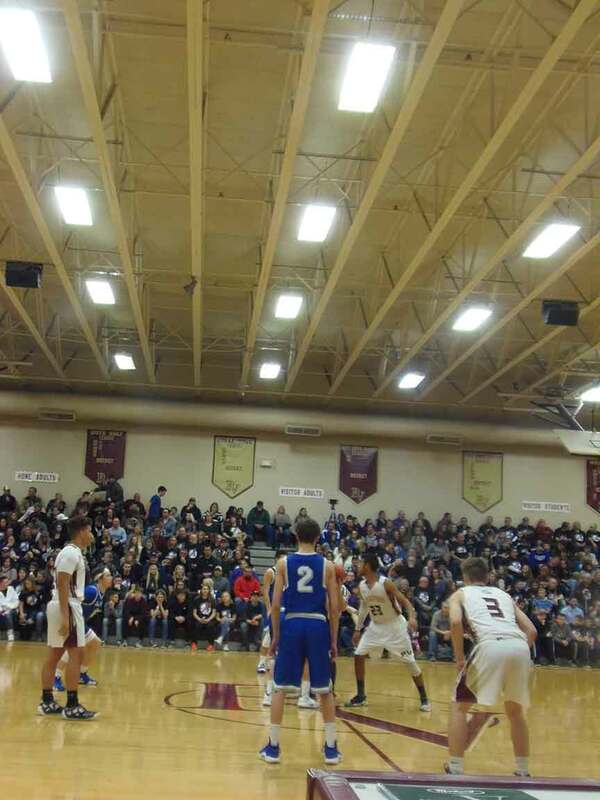 ANDOVER – The Pymatuning Valley Lakers had a little extra motivation in their recent rivalry game against the Grand Valley Mustangs. Pymatuning Valley held a fundraiser for teacher and coach Steve Urchek who was recently diagnosed with pancreatic cancer. Pymatuning Valley started fast as they outscored Grand Valley 17-2 in the first quarter and went on to win 58-35. Austin Roberts and Jonah Wilkerson each scored six points in the opening quarter for the Lakers as they jumped out to a big lead. Nick Sapp added a three-pointer and Tanner Rhoades added a basket. Malik Mitchell scored the only two points for the Mustangs in the first quarter. Grand Valley stepped up the defense in the second quarter as they outscored Pymatuning Valley 9-8 in a low scoring second quarter. Malik Mitchell hit a pair of three-pointers for Grand Valley in the quarter. Derek Jackson added the only other basket and Ashton Zupancic added a free throw. Jacob Saxion, Sapp, Roberts and Wilkerson combined for the Lakers eight points in the quarter. Pymatuning Valley got back on track in the third quarter as they outscored Grand Valley 17-12 to take a 42-23 lead going into the fourth quarter. Austin Roberts had a big quarter with eight points. Nick Sapp connected on his second three-pointer of the game and Jonah Wilkerson added four more points to hits total. Josh Huffman came off the bench to score four points for the Mustangs in the third quarter. Dante Accettola also had four points in the quarter. Mitchell and Zupancic combined for the other four points. The Lakers outshot the Mustangs 16-12 in the final quarter for the 58-35 win. Jonah Wilkerson took over down the stretch for the Lakers with six points, including four free throws. Wilkerson finished the game with 18 points. Nick Sapp added five points in the quarter, including his third, three-pointer to finish the game with 13 points. Tanner Rhoades added a three-pointer in the fourth quarter to finish with five points. Logan Drnek also hit his only basket. Austin Roberts was the only other Laker player in double digits with 16 points. Malik Mitchell was the only Mustangs player in double digits with ten points. Pictured: The Pymatuning Valley Lakers get ready to tip-off against Grand Valley during a Northeastern Athletic Conference basketball game.